Peninsula Players Theatre will present a reading of Apparitions, by award-winning playwright Kristine Thatcher, Feb. 4, 7 pm, at Björklunden, 7590 Boynton Lane in Baileys Harbor. Admission is free. In the mid-1990s, Peninsula Players commissioned Thatcher to write a play using Door County’s history and distinctive character as its major influences. 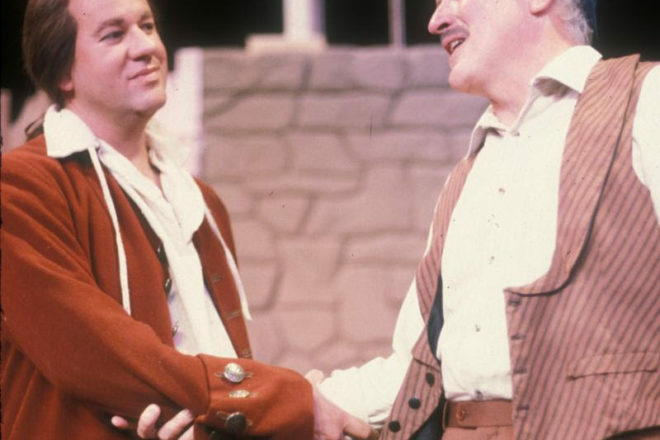 Apparitions, which made its world premiere in 1995 at Peninsula Players, centers on some well-known and lesser-known stories of Death’s Door that include seven early explorers and settlers. In telling their often grim stories of hardship and peril, their characters bring some of the county’s history and legends to life. Cast in the reading are Peninsula Players veteran actors Cassandra Bissell, Neil Brookshire, Mark Moede, Noah Simon, Barbara Simpson Fuhrmann, Larry “Thor” Thoreson, and newcomers Sam Hubbard, David Stobbe and Matthew C. Yee. The 2019 season of The Play’s the Thing – part of the Players’ winter outreach programming – also includes Tales of Men and Ghosts, adapted by Steve Pickering from stories by Edith Wharton, to be performed March 4; and Love, the Cracksman, a new, fast-paced comedy by Mark Brown, on April 1.